KitchenAid, founded in 1919 by The Hobbart Corporation to produce mixers, is one of the most recognizable brands in America. While their KitchenAid stand mixers are the most popular item in their line of products, KitchenAid also manufactures large appliances for the home. The brand touts one-of-a-kind technology and timeless designs for each appliance they create. When smart features fail and your KitchenAid appliance is in need of repair, call Action Appliance Repair. With over 50 years of experience, Action Appliance Repair are experts at servicing KitchenAid appliances. We know just how distressing a broken appliance in your home can be. It can disrupt your everyday life. We are experts at repairing KitchenAid appliances and providing unmatched customer care as well. Since 1961, our family-owned and operated business has focused on putting our customers first and is proud that they return year after year for their service needs. Never trust your KitchenAid appliance to a generic service center. Let the professionals at Action Appliance Repair get your machine up and running like new again. The next time your KitchenAid appliance breaks or needs maintenance of any kind, call us toll free at 866-611-4479. 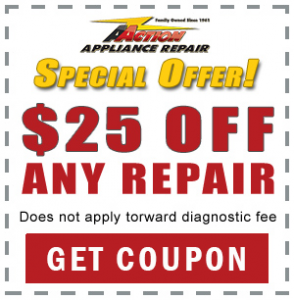 Action Appliance Repair ensures you get the best price and customer service in town. Your service call is absolutely free with each repair we do. When your KitchenAid appliance is in need of repair then be sure to call Action Appliance Repair for quality work you can trust. We are experts in KitchenAid appliance repair and our knowledgeable technicians will give you peace of mind that you appliance is in the right hands. Along with our trusted professionals and excellent service, we proudly offer our customers a 5 year pro-rated parts warranty. So what does calling Action Appliance Repair for your KitchenAid appliance mean for you? We waive the fee of our service call if we repair your KitchenAid appliance. You won’t owe us anything if we visit and are able to repair your appliance.